Who said bunnies and dogs do not get along! Well as we know with our furry family members each has their own unique personalities and can make a happy family no matter the pedigree. No surprise the dog bone bunny is what you see is what you make … made from a dog bone. 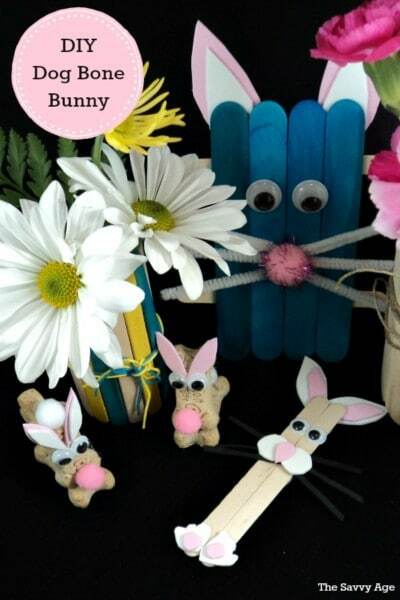 A little glue and a visit to your dollar store and craft stash can make this twist of the DIY bunny for your Easter Basket. Lay one dog bone on a table with the end facing you. Apply a substantial amount of glue (or you can use a glue gun) to apply the glue on top of the end of the dog bone. You will be making a L with the dog bones for the base of the Easter Dog Bone Bunny. Place the end of the second dog bone, vertically, on top of the glue. Press the ends of each bone together and hold until the glue adheres. If using a glue gun the glue will adhere very very quickly. If using craft glue, allow time for the glue to dry. Cut out the pink ears from pink foam paper. Glue the ears in a V shape about 1/2 inch towards the bottom from the top of the dog bone. Glue the googly eyes on the bottom of the V.
Place the pom pom in the middle of the bottom of the dog bone ends. Glue! Set the dog bone bunny aside and let the project dry. The Dog Bone Bunny is very quick to make and after the first test bunny the rest of the bunnies will be made very easily. This bunny is made with traditional Easter colors, but any colors of foam paper or pom poms can be used. Don’t we all have a non traditionalist little crafter in our house. the same holds true for how “neat” or “perfect” the finished bunny will be; there is alot of flexibility depending upon the age of the crafter. It does not have to be “perfect”, this is a whimsical take on the homemade Easter Bunny. 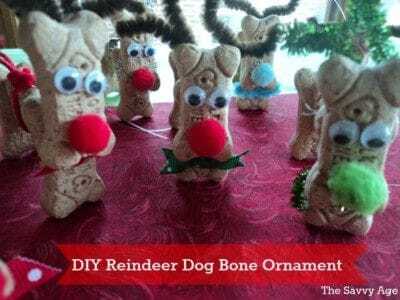 Looking For More Dog Bone Craft Ideas? The first dog bone craft I made was for Christmas and the little Reindeer Dog Bones made fun little stocking stuffers or homemade Christmas ornaments. As with any dog bone craft a word of caution. These are not edible crafts and may attract the attention of your favorite furry family member. I do not use dog bones for crafts when the furball is in the area… just saying. You come up with some of the cutest crafts for kids. This is adorable.